One of my PhD students lamented this week with me that she had a lot to juggle (taking children to and from schools and to and from activities, etc.) and that she needed a strategy to make her research move forward. I had been planning to write this blog post for a while, since this is the one question I get asked the most by doctoral students (”how do I plan my unstructured time over the summer” being the other one). Do you have one like this but for dissertations? From how to pick your topic to how to plan your chapters or something similar? I had to rush to get this blog post done because my student is 2 years away from the deadline her university has imposed for her thesis defence, which is why I sat down with her last night to show her how I do things. I have two other PhD students at exactly the same stage (2 years to defense) so I figured I might as well finish this blog post. While I’ve suggested that people read one (or more) of the books that I’ve digested myself (check my Writing a Doctoral Dissertation page), one of the main things I teach my students is how to apply backcasting techniques to develop a project plan. I was trained as a project manager, and I worked in that capacity for a number of years, so I understand exactly the kind of work that needs to be done to develop good project plans. There are a few resources for students, which I mentioned on Twitter earlier today (October 5th, 2018), many of which are listed in the thread that will appear if you click anywhere on the tweet shown below. Thanks to everyone who responded to my query, though I think many of them were professors describing their own process, which is not the same as having a doctoral dissertation (ONE GOAL) to finish in X number of years. My students are doing theirs in the 3 papers’ model, which is a bit closer to the day-to-day life of a professor, but still, the trajectory is quite different. Anyhow, here are some recommendations (click on the tweet to expand the entire thread). Everyone: one of my PhD students today asked me how to plan her day/week/month/time table. Can you tweet me your process before I tweet/thread mine? Thanks! (I'm off to dinner because I've already written 460 words). The core planning strategy I would thus recommend doctoral, masters and undergraduate students is to engage in a combination of Gantt Chart Design and project backcasting techniques. 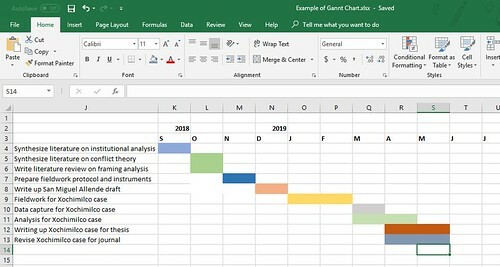 The Gantt chart is a technique I learned in graduate school when I took project management courses. This is a hypothetical Gantt chart for my doctoral student, covering about 15 months. What I suggested to her was to use backcasting techniques to plan backwards from her goal (PhD thesis defense) to intermediate goals. This post explains how I backcast a project https://t.co/wAmyejeoa0 since her dissertation is a 3-papers one, I suggested she uses that model. For Gantt Chart templates, you can see Dr. Emma Sheppard’s here. Here is another resource that you can use to create Gantt Charts. Hugh Kearns and Maria Gardiner have lots of resources on their site, and have published books on this as well. Dr. Patrick Dunleavy’s book “Authoring a PhD” is incredible and really does help students who are planning their PhD process. I recommend it to my own doctoral students. And of course I would be remiss if I forgot to recommend Dr. Ellie Mackin Roberts (my coauthor for a forthcoming book on research planning) and her website. Ellie has A TON of downloadable printables for you to plan your own research. She is fantastic. Both for doctoral students AND for post-PhD folks, my coauthor Dr. @EllieMackin has an entire website for research planning https://t.co/unXMqmaf2Z she offers FREE downloadable printable templates that you can use to plan your own research. In the end, the process I recommended to my students and that I do myself is – set a target defense date and then work backwards and plan tasks, activities, and intermediate goals. For example, I have asked my students to plan submission dates for their 3 papers (to be sent to journals) and then schedule fieldwork and data analysis accordingly. This process has worked well, and I hope my description of the process will help my students and others! In a subsequent blog post I’ll describe how to go from long-term goals (submit paper X by Y date) to daily tasks. That blog post will definitely apply to doctoral students and post-PhD folks.